Morgan has recently found a sunny spot at the office too. I've noticed that he's really a lot more calm after he's spent some time in the sun, and it seems to go beyond the normal relaxation that happens from being warmed by the sun's rays. I always thought my little Molly was wierd because she always lays in sunbeams. She's a beagle-sheltie mix. I thought only cats did that! But I guess dogs need vitamin D too! My cat used to do this all the time. I thought it was for warmth. Duh, I never thought of Vit. D.
This picture is fantastic. 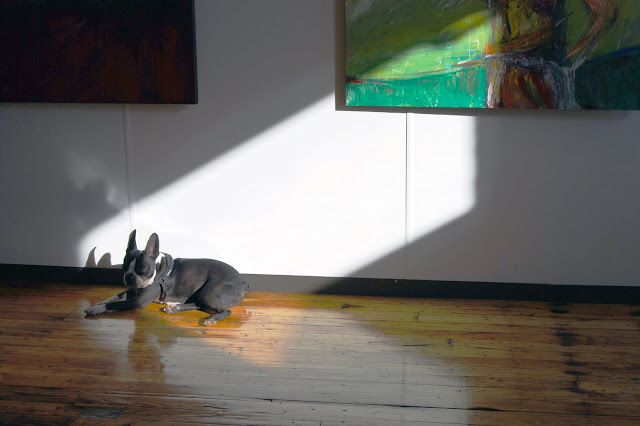 Our Boston Terrier looooves "sunning." She finds the perfect spot, lays down, and collapses into bliss. It's wonderful, and I often wish I could do the same! Too cute! I want to cuddle it! That is so cute! My dog loves to sit out on my deck in the sun. Thanks for stopping by on my SITS day! It means so much to me. So precious! My Poo-Air loves to sun his French Bulldog body in sunbeams.